The last ten years as a History teacher have taught me that of all the historical concepts which we deliver daily in our classrooms, historical interpretation is perhaps one of the hardest to land. With my Year 7 students this year, I'm determined to equip them with a better sense of what an interpretations are, along with how and why they are constructed. Two weeks ago, I chose a moment during my new Year 7 unit of work on invasion, migration and settlement in Britain before 1066 to begin this development. Our work on the Vikings offered the ideal opportunity to do this. I planned to introduce my students to two interpretations of the Vikings. Firstly, the traditional view, which originated first as a result of Anglo-Saxon depictions of the Viking hordes and which has subsequently been perpetuated down the ages, coming to dominate both the popular imagination and Hollywood portrayals. In this view, the Vikings are presented as barbaric warriors, who devastated the lands they came to by raiding, destroying and killing. In contrast to the learned and civilised Christian peoples of Europe, the Vikings are depicted as primitive pagan brutes, devoid of literature, technology and culture. They unleashed a destructive plague upon peaceful Christian society. I found useful initial stimulus material for my students from the 1958 movie The Vikings. In their first activity, students were asked to watch the trailer for the movie below and to keep a note of the costumes, props and behaviours exhibited by Vikings during the footage. They then worked with a partner to come up with describing words for the Vikings based on what they had seen. Feedback from the class soon allowed us to draw out a picture of the traditional impression of the Vikings. Having done this, I introduced students to the revisionist view of the Vikings. In this challenge to the traditional orthodoxy, the Vikings are presented as traders and settlers, possessing a developed cultural and literary heritage and advanced technologies. In this view, they were no more nor less violent than their contemporaries from the Christian world at that time. We compared the two views and students were then assigned to one of the two interpretations. They were then required to decorate a Viking mask by summarising the main opinions of their historical viewpoint. Students threw themselves energetically into this task and with a little assistance from me to cut the eyeholes, were soon ready to put on their masks! We compared the two viewpoints and made masks to summarise them. As the lesson moved towards its conclusion, students were presented with a selection of factual statements about the Vikings. At this point, students were asked to put on their masks and look at the evidence through the eyes of their specific group of historians, selecting which facts they could use as evidence to support their particular view of the Vikings. This part of the lesson was particularly powerful. By this point, my budding Year 7 historians had already begun to make comments about why historians might have come to different interpretations of the Vikings. Some of them had begun to come independently to conclusions about the origin of the two different viewpoints and were already linking them back to prior learning through critical comments about the Anglo-Saxon chronicle. Having decided upon their evidence, students then discussed their findings with a historian of the opposing view, describing the evidence they had chosen and explaining how it supported their view. Students were asked to select evidence to support their historical interpretations. The final phase of the lesson was a piece of differentiation by task, with students choosing their own task by virtue of self-assessment of their own capabilities. The first option presented to students was that they could explain one of the two interpretations, selecting, deploying and explaining relevant evidence to support. The second option was to compare the two interpretations, identifying and explaining reasons why these two interpretations have developed. As the lesson drew to a close, I was satisfied that for the first time in Year 7, my students left the room with a firm and memorable grasp of how and why historical interpretations arise. The groundwork has been laid in place for some work on changing interpretations of Alfred the Great over time. I couldn't miss this photo opportunity! This comes from some CPD I'm delivering on active engagement. 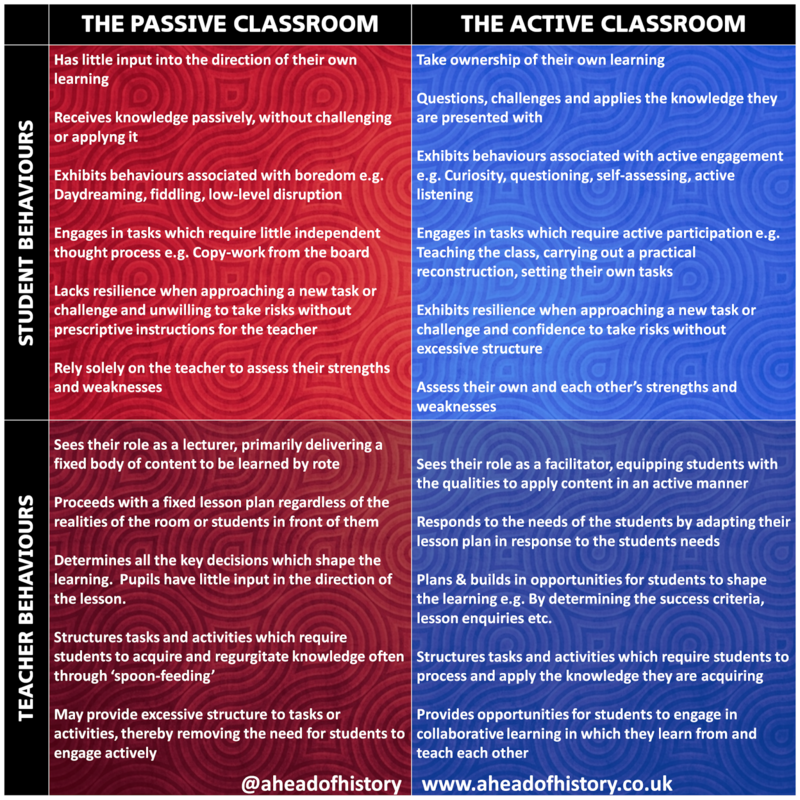 An overview of the behaviours and qualities associated with both active and passive teaching and learning.